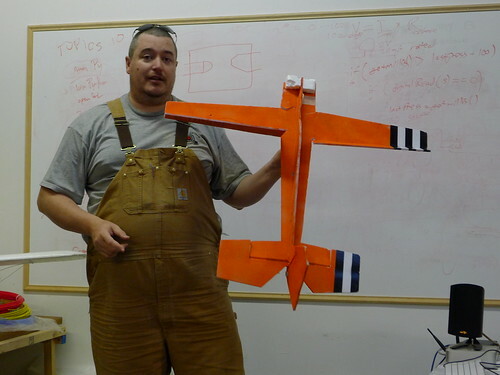 Aaron did a talk on the basics of remote control planes at Ace Monster Toys after the weekly meeting yesterday, June 9. A number of us have been talking about building an unmanned aerial vehicle (UAV) or drone using some of the materials from DIY Drones for the electronics portion (they use arduino based autopilots). The main barrier is not doing the electronics but actually knowing how to fly an RC plane well. Electronics we are good at! Building a plane with a couple of hundred dollars of electronics plus cameras and parts is no good if you crash it the first time you fly. Aaron has a lot of experience as a hobbyist doing RC planes and offered to do a talk explaining a bunch of the basics to people. He went over the basic ideas in RC planes, showed how he had built his own planes out of foam, as well as showing one of the ready to fly planes that he had bought and modified.</p><p>Following the talk, we got to play with Aaron’s RC plane flight simulator and find out just how horrible we all really are at flying anything in real time. After crashing repeatedly, I was convinced that a lot of practice in the simulator will be necessary before much flight. I have a ready to fly plane that I’ve picked up for cheap with a three channel controller. I plan to head out to one of the local parks with Aaron on a weekend and try flying it (after the increased simulator time). Once I’ve gotten used to doing that, I’ll be adding the autopilot, GPS, new radio, and other electronics necessary to turn it into a UAV. There is no point in doing so if I cannot get it off the ground, keep it there, and then land it (intact! ).